The rise, rise and rise of nasty little signs, of nasty little companies, and the fall, fall, fall of the temperature #narrowboat #England – The Diesel-Electric Elephant Company. It was cold enough today to make a penguin weep. Such a response would have been pointless though, since even salty tears would have frozen solid before they hit the ground. I didn’t realise just how cold it was until I set off cruising. My nose disappeared first, then my fingers. A couple of hours later, when I came in to moor up, there was a chap walking his dog. I had difficulty talking – my mouth wouldn’t work properly. Twas a very pleasant cruise, for all that. This canal is twisty-turny, and I steered corners of every radius from right-angle to s-bend. Don’t be deceived by the blue sky – everything was frozen, apart from the canal itself. Just under five of the miles today. I had intended going much further, but it was just so damned cold that I gave in, and we are now moored at Gailey Locks, just ahead of the services. The next cruise-ette will be via the services for rubbish, water and gazunders, and will be about two miles and six locks. The overcrowded moorings at Gailey Lock. Well, that’s probably got something to do with the signposts, all of which a boater is somehow, miraculously, super-humanly, supposed to read in full on approach and before even moving in to moor up. 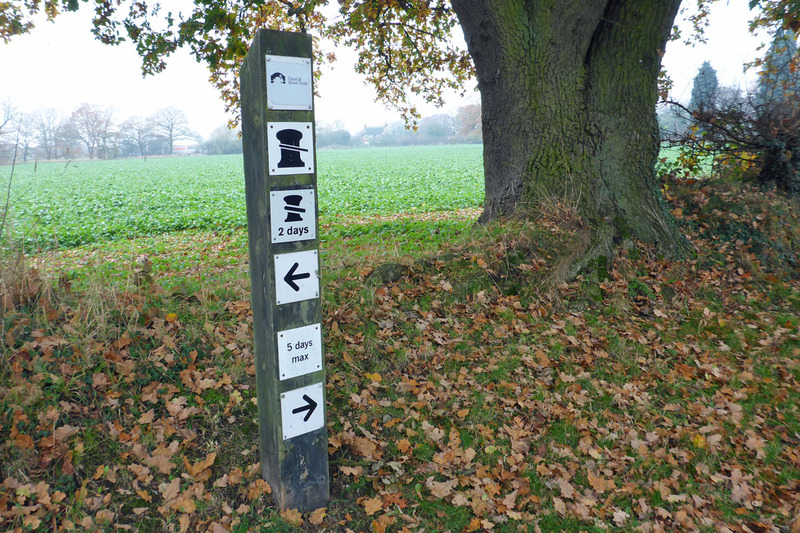 A multiplicity of signs and of opportunities for misunderstandings. What a strange world we are creating for ourselves, with dictats here, there, and everywhere – but only the institutions ever get to make the dictats, we individuals must do nought but follow them… baa …baa. The farthest sign has arrows (of its own) pointing in both directions along the canal, and offers a choice of either “2 Day” or “5 Day” moorings, but since there is no additional sign indicating “Restrictions apply all year” these are, between the months of November and March, actually the 1995 Waterways Act duration of 14 Days and not the lesser “licence terms and conditions” (id est, blackmail by contract) 2 or 5 days. 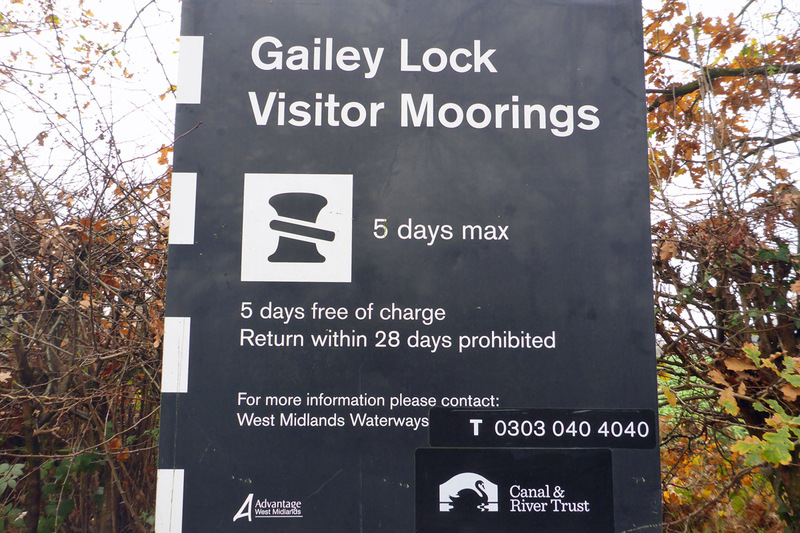 The middle signpost has no arrows of any sort, but reads “Gailey Lock Visitor Moorings – 5 Days max no charge – return within 28 days prohibited”. 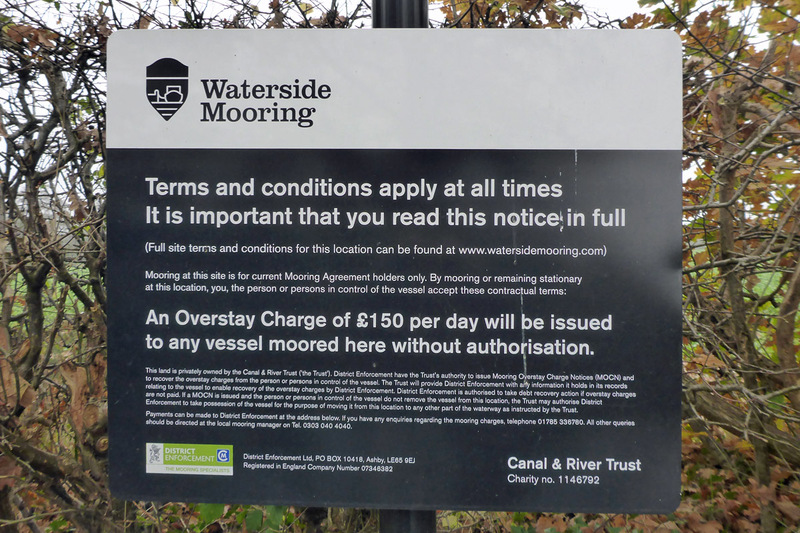 The two signs on the post nearest the camera have an under-sized arrow (pointing “out” of frame, behind the camera) and dictating “Permit Holders Only” and offering a £150 per day “overstay charge” to any “unauthorised” boat mooring there. £150 is just shy of 25% of the single person’s gross monthly old age pension in England. The “overstay charge” is administered at the discretion of a company called ‘District Enforcement’, which is in point of fact better known – as in thoroughly notorious as – a car parking company of no morals, ne’ery a scruple, and absolutely no shame. I am amazed that the Canal & River Trust is in bed with such a bunch of cowboys. I do wonder if perhaps someone, somewhere, hasn’t had to have some tailoring changes made to their favourite business suit, to accommodate a wallet with a bigger bulge. Why else would CaRT foist this sort of arrangement on their beloved boater community? I think that I have moored in the “5 Days” section, which is all of one and a half boats long. The “2 Day” would have done just as well, since I intend being here overnight only, but I was only initially looking for the best tree/armco combination, and not reading distant signs. Fairly sure that I am not moored on the urine-marked territory of ‘District Enforcement’. Welcome to Gailey, my arse. Anyway, in spite of freezing my nose off, the cruise today was most pleasant if, as per usual, a little odd in places. One stretch passes right through the middle of a vast chemical factory (unspecified chemicals) that some throbbing, ten-ton brain in the local planning department has plonked down either side of the canal. No photos of that – there are signs as you approach the tangled mass of vapour-emitting pipeworks warning of “No stopping or mooring even if you hear an alarm”. Whether they mean an alarm from the chemical plant or from the boat is not specified. I neither stopped nor moored, but hoofed on through at flank speed – I remember Flixborough, even if no-one in the local planning department apparently does. I was lucky enough then to only hear the distant explosion as the Flixborough plant, some thirty miles away from home-at-the-time, blew up. Government Health & Safety Executive report here. …and some video here. I spent that day listening in to the Police radios… illegal, but informative. Flixborough was the biggest peace-time explosion ever in Britain. I don’t like cruising through the centre of chemical plants. That part of today’s cruise was …uncomfortable. Still, we made it through without our nylons exploding, so all is well that ends well. I am not convinced that we are far enough distant yet though, which is one reason – aside from Gailey’s institutional and signal rudeness – for moving on again tomorrow. Ugly traffic roaring past on an ugly road. Having spent three years without a car and only infrequently being taking for a ride in such a conveyance I recognise that they are useful things, but how horrid they are. Noisy, smelly, polluting and quite insane in the way that they pass pedestrians within inches, and are separated from meeting each other head on by onlywhite lines and a few cat’s eyes. Take a break from cars and you really can see what insanity they are. The brick building with the castellations is part of the old canal network at Gailey Lock, it is the old toll-collector’s watch-tower (I kid you not) from the cargo-carrying days of the network. These days it is a shop. The canal lock is right alongside and under the A5(T) mess that we’ve made of the old Roman Road, and it has two little tunnel stubs, one for pedestrians to pop out of and one for me and my boat to pop out of tomorrow. I can’t help but think that when I go through it will feel akin to being flushed like a 57′ turd into a Victorian sewer pipe and beyond. What a thoughtful little gap they have left in the railings so that I can wedge the Cardinal in place and nip back through the other tunnel and up top to close the gates. One little drainpipe for boats, one little drainpipe for pedestrians. Gailey Locks. 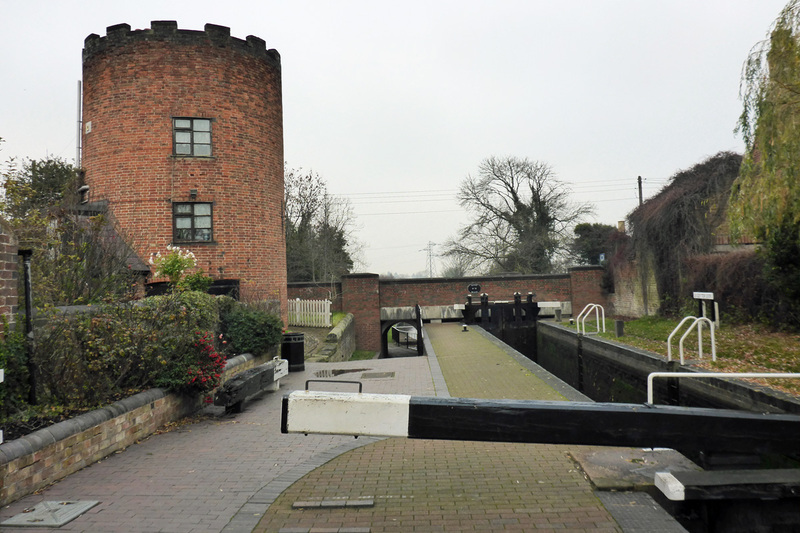 The header photo shows you where the roundhouse tower is exactly, above and to one side of the first of the next cruise’s locks. That assumes three things of course. That I defrost after today’s bitter cold, that ‘District Enforcement’ don’t cart me and the Cardinal off to some concentration camp overnight, and that the bloody chemical factory that we cruised through the middle of doesn’t hiccough in any serious way. It’s feet up in front of Mr Stove again this evening, veggies steaming gently (feet steaming gently, too, if I’m honest about my socks), and bed calling as early as is usual in this hibernation-encouraging season. I love my bed. Ian H., and Cardinal Wolsey. Are you pootling uphill or down? … or rather upstream or downstream? My goodness. So many rules for such a small place. It makes one glad not to meet the person who felt all the rules must be made and signs posted and various punitive measures taken. I hope you vacate toot sweet and leave the chemical explosion potential and the tight assed rule maker far behind. Still, you do have good taste in pretty places to stop. It’s is picturesque. Ee by gum, them were hardy folk back in 1974 compared to todays ‘eye witness accounts’ you see on the telly and monstrouisly eloquent with their descriptions of the exlosion and what it physically did to them. Not one over used ‘like’, it was like reet fluent, like, y’know? Just another observation on how clean everything seems along the canal system.I think I spoke too soon about the icicles hanging from your nose, sorry! P.s I don’t seem to be receiving your e mail alerts for your posts, have you stopped doing that? Please excuse all spellos having a bad day today! Re the email notifications – I haven’t changed a thing, but you never know if WordPress has… fingers crossed that they start again. I loved the interviews on that video – not one “like”, not a single “awesome” and not a trace of victim complex among them. ‘Tis blimmin cold here, too. Thick white hoar frost this morning; lovely to look at obviously but I stayed in bed with my hot-water bottle. Made vegetable soup too, lovely with a squeeze of lemming. Happy cruising and I hope you find somewhere friendly tomorrow.